A change in prior use rights (“PUR”) would be a benefit to both trade secret and patent protection. By filing a patent application, unless a request for nonpublication accompanies the application, the invention will be published and therefore disclosed. Since the patent may never be granted, protection is not guaranteed. For PUR, there is no publication and thus definitive protection. In the long run, this may mean that the number of defensive patent filings may decrease in favor of reliance on PUR. This in turn would mean that inventors may not feel as obligated to file patents over things like minor changes in a process. PUR would be especially important in protecting trade secrets in an industry such as the pharmaceutical industry, where the information to be protected is fragile by nature. In the internet age, secrecy that must be maintained is most threatened by data mobility and especially by employee mobility. Since the pharmaceutical industry has one of the highest rates of employee mobility, maintaining trade secrets under any circumstances is particularly difficult. Pharmaceutical firms also typically rely heavily on outside vendors, presenting even more of a chance for data disclosure. One major drawback to PUR could be the potential disruption of the patent portfolio valuation processes. For starters, it is difficult to evaluate how PUR and trade secret protections will fit into company valuations. This is of particular importance to startups, where the company’s patent portfolio value can be a critical factor in an investor’s decision to pursue the company further. Also of concern for both large and small firms is that PUR will devaluate patents overall. In typically competitive markets, it will be uncertain whether potential infringers have secrets and therefore unknowable PUR, which would lead to the weakening of patent protection. In terms of preference, larger pharmaceutical companies may choose patent protection due to the availability of injunctions, money damages, and other remedies. For smaller or startup companies, PUR do not appear to be a viable patent alternative at all, particularly due to the requirement of secret commercial use for more than one year to qualify for PUR. Many startups never intend to commercialize their product, as they are just looking to be acquired by a larger pharmaceutical company that they hope will eventually commercialize the product. PUR usage may just prove to be technology dependent. For technology that moves quickly, PUR may be irrelevant, but PUR may be very important for technology that moves more slowly. Fortunately, if desired, inventors can delay making the decision on whether to rely on PUR or patent protection by using a “patent insurance” strategy. This strategy involves first filing a provisional patent application, followed by filing a non-provisional application with a non-publication request within 1 year. This can buy the inventor additional time to both establish the 1-year commercial use that is required to establish PUR, as well as more time to monitor published applications and evaluate what direction of protection to pursue. The patent could then be fully prosecuted, or should PUR prove to be the better option, the patent application could be abandoned without trade secret-destroying publication or disclosure. Information provided on social networking sites. Updated 2:08 p.m. / To add Facebook comment. Users of social media who don’t restrict the information they share online have a higher risk of identity fraud, a new report from Javelin Strategy & Research finds. The incidence of identity fraud in 2011 rose to about 5 percent of the adult United States population, up from roughly 4 percent the year before, the report found. But among Facebook users with public profiles, the rate was 7.5 percent, while users who accept “friend” requests from strangers had an even higher rate, of nearly 9 percent. The study defined a “public” profile as one that allows strangers to see personal information, including profiles open to “friends of friends.” Roughly a quarter of Facebook users have public profiles, the study found. Fred Wolens, a spokesman for Facebook, dismissed the survey’s findings, saying it doesn’t reveal any higher risk of fraud among Facebook users because the percentages reported were within the survey’s stated margin of error. “This survey doesn’t prove anything,” he said. He added that it is “common sense” that if you post about your dog using its name on Facebook, you probably shouldn’t be using your dog’s name as any sort of password. While there’s no direct “causation” between using social media and identity fraud, the report found, the behavior of those participating is probably a factor. Information revealed in public profiles, including your full date of birth or your mother’s maiden name or the name of your pet, is valuable to thieves because companies often use such information to verify your identity online. 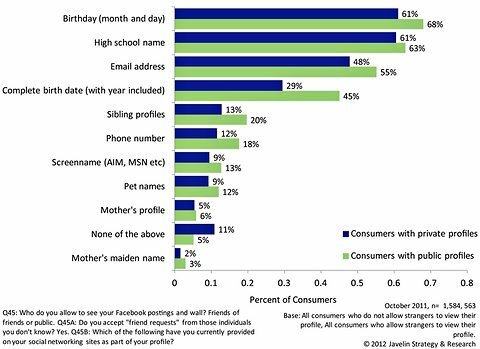 Nearly half of those with public Facebook profiles revealed their full birth date, including the year, compared with about a third of those with private profiles, the report found. “The proper use of privacy settings on social network profiles is essential to reconcile the connectivity of social media with the protection of personal information,” the report said. Smartphone users, too, face a higher risk, the report found, with nearly 7 percent of users experiencing fraud in 2011. Smartphone users’ generally higher incomes may contribute to their higher risk, but behavioral factors may also play a role, the report found. For instance, a third of smartphone users store personal information on their phones, but only 16 percent have installed software that allows them to remotely wipe the device if it is lost or stolen. What steps do you take to guard your privacy when using social media? Posted on June 5, 2012 by ipconcerns Tagged copyrightinventionpatentpatent applications	CommentsNo Comments on Can a Copyright be protected with a Patent? Can a Copyright be protected with a Patent? So it seems. In 1999 Digimarc filed a provisional patent application that began a series of continuation patents where the invention appears to be a technological method of enforcing a licensing agreement that limits the number of times a video can be accessed by a user. The title of the patent is a Method and apparatus for content management. The patent includes two steps, first is to maintain a list of users who have accessed the items and the second is to restrict the access to the items. By using what the inventors call “electronic memory” and a “programmed electronic processor” that are both parts of a “portable device,” it appears that this patent has indeed protected a copyrighted item. The United States Patent and Trademark Office (USPTO) has just created a new category for filing applicants; the Micro Entity. However, not all of the rules and fees have been decided about this new entity. Similar to small entity status, Micro Entities will be entitled to a reduction of patent application fees (75% for Micro Entities versus 50% for small entities). “Micro Entity” is however, a bit of a misnomer as an applicant can qualify as a Micro Entity either by having an income of less than three times the median household income (approximately $50,000 based on 2010 incomes) or by being under an obligation to assign or license the application to an institution of higher education. The latter route might be particularly attractive to universities, as it enables Micro Entity status for most university-affiliated researchers. The USPTO recently published a set of proposed regulations for establishing Micro Entity status. In large part, these regulations would implement the Micro Entity status requirements set out in the America Invents Act (AIA), while providing some further clarification in a few areas, such as multi-inventor applications (all must meet the Micro Entity requirements). Prior to the AIA, the terms “applicant” and “inventor” were synonymous. After September 16, 2012, however, it is possible for an application to be made by someone other the inventor. The Micro Entity section of the AIA uses the term “applicant;” but there might be a change to “inventor.” Even when these proposed rules are finalized, the discount will not be available until the PTO sets or adjusts patent fees under the fee setting authority provision of the AIA, something that it indicates will not formally occur until around March 2013. Stay tuned for more Micro Entity rule changes as they happen.